One more sign you’re accepting your disability – literally! Not to get too serious as the weekend finishes, but I woke up to quite a nice surprise today. 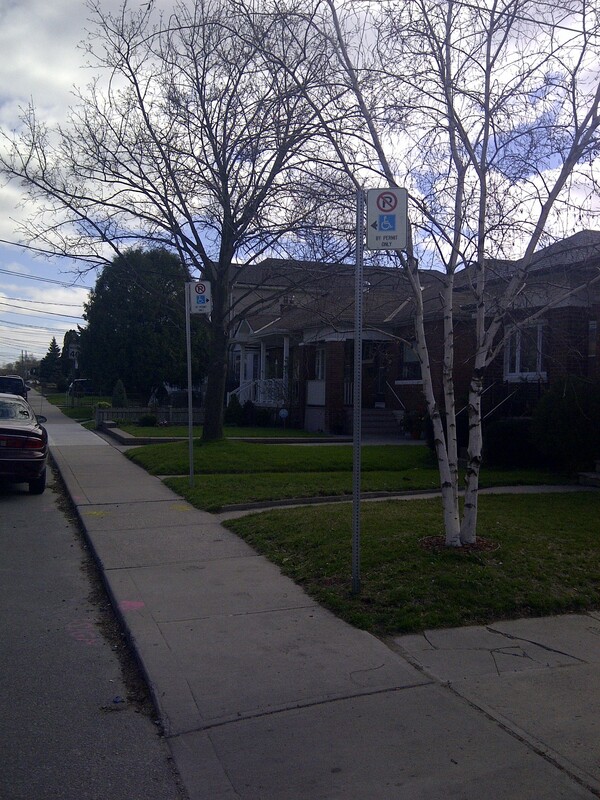 The city of Toronto finally came through and last week I walked out to my car to find some new signs on my front lawn. It must be a sign! No, seriously. Two of them...and no M. Night in sight! You see one of the interesting transitions in this past year (and my god it has almost been a year…more on that later) has been the situation with my driving. We’ve changed up cars to something bigger, which meant I could no longer use the charming, yet tiny car port in the back. Now I have to park on the street, which creates its own hassles. Yes, yes I can already hear Matt and Arthur bugging me about all the perks of needing a wheelchair and cane to get around. Just wait till we finally have a winter (a real winter, not this fake one that just past) then we’ll see about all those so-called perks. In the meantime, this makes things a lot easier getting in and out of the house. You see we have one of those odd streets where for half of each month you have to switch sides of the road that you park on. Never really understood the logic of it (guess its to be “fair” to both sides). With that policy, not only did I have to worry about how many houses down I sometimes had to park, but more I had to worry about stumbling crossing the street! Yep…the legs have got that bad. Hard to believe we’re almost at one year since surgery #3. I admit in many ways I’m adjusting better than I thought…in others…well let’s still just call it very much a work in progress. I see the surgeon again in about two weeks and already had my own personal hell in a tube that is my umpteenth MRI. I expect there will be many thoughts as the day comes closer to an anniversary I never wanted. Let my vaunted skills of procrastinating begin! (I easily get +5 to my procrastinate roll modifier by now dammit).